I've talked before about my love for Pinterest. The internet can be such a wonderful thing. Something I've been trying to do is to have more rounded meals. I had fallen into a rut where we had our main dish and maybe a side if I remembered to throw something out there at the last minute. Not very exciting. Plus there weren't leftovers to send with my husband and for me to eat the next day. So Pinterest has helped me to create more exciting meals. Now we have a main dish, at least one side, and some fruit to go along with. My husband likes it and it means I can sneak in more veggies and fruit with everyone. Double win! I thought I would start sharing my meals that I've put together using Pinterest. These are all recipes tried by me and given my families stamp of approval. This week gyros! Gyros are my new favorite meal. I find myself craving them every couple weeks. They are so good and a little on the lighter side which is nice to mix in with those heavy, delicious meals. It makes a girl feel likes she's trying to diet. I've meshed pieces of different recipes to create my perfect gyro. 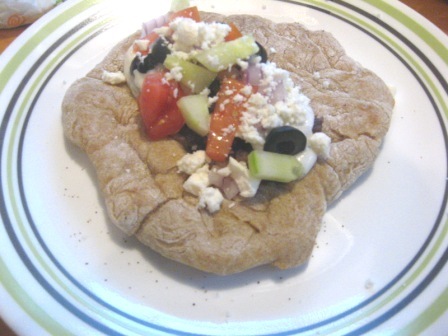 Whole wheat pita bread by Annie's Eats- Do not be afraid of making pita bread. It's actually pretty easy. And once you've had homemade those store bought ones taste kind of like cardboard. I make a double batch when I make them and throw them in the freezer so I have some around for next time or lunch time pita bread pizzas for the kids. Gyro filling by Tasty Kitchen Blog- I adore this beef filling. It's so good and super fast. Tzatziki Sauce by Annie's Eats- The reason I like this tzatziki sauce versus the one in the recipe with the gyro filling is the fact that the cucumber is shredded giving it a finer texture although I do add some dill to it just like in the recipe on Tasty Kitchen Blog. Greek Couscous Salad by Jonesin' For Taste- Obviously this is a favorite in our house...you know...it's from my own blog. Serve with a fruit salad. I personally like a mango, blueberry, strawberry salad with this. Light and refreshing and fitting for this bright and colorful meal. Perfect perhaps with the warmer weather we are having here in the south. Hope you enjoy this meal as much as we do. Do you like this feature? Is this something you want more of? Let me know in the comments what you think.